So on a Friday night when the nation has its attention on a rapidly intensifying category 4 major Hurricane making landfall, the coward Nazi serving as our President pardoned his fellow racist birther felon former Sheriff Joe Arpaio and issues an official order banning transgender troops from serving in the military. 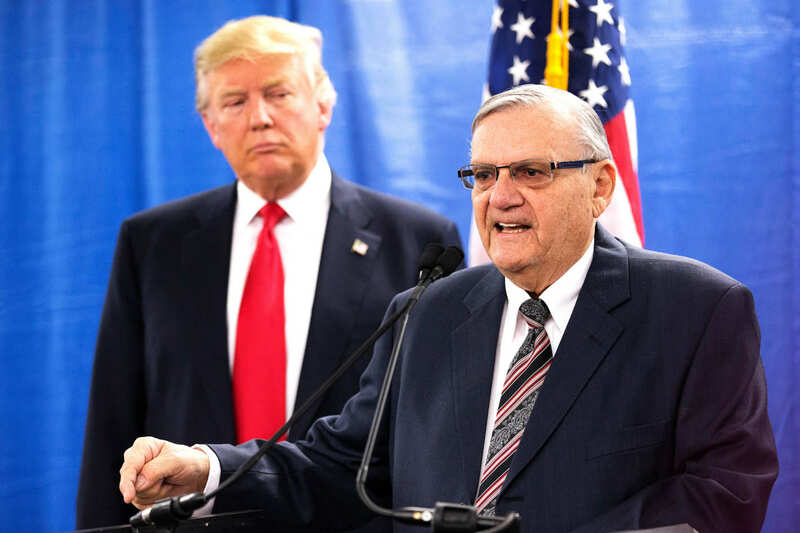 “President Trump pardoned Joe Arpaio, the former Arizona sheriff whose aggressive efforts to hunt down and detain undocumented immigrants made him a national symbol of the divisive politics of immigration and earned him a criminal contempt conviction,” the New York Times reports. President Trump has directed the military not to move forward with an Obama-era plan that would have allowed transgender individuals to be recruited into the armed forces, following through on his intentions announced on Twitter a month earlier to ban transgender people from serving. The presidential memorandum also bans the Department of Defense from using its resources to provide medical treatments for transgender individuals currently serving in the military. Trump also directed the departments of Defense and Homeland Security “to determine how to address transgender individuals currently serving based on military effectiveness and lethality, unitary cohesion, budgetary constraints, applicable law, and all factors that may be relevant,” a White House official said. The official signaled that the administration was returning to the military’s pre-2016 policy under which no transgender individuals were allowed to serve openly in the armed forces, but said Trump was giving the secretaries of defense and homeland security leeway to determine the policy on currently serving transgender troops. Federal Reserve Chairwoman Janet Yellen “offered a forceful defense of broad new banking regulations enacted after the 2008 financial crisis, saying the rules safeguard the economy against another crisis and rejecting assertions from President Trump and top aides that they should be rolled back,” the Washington Post reports. “President Trump handed Democrats a gift this week with his vow to shut down the government if he doesn’t soon get money for his border wall. Democrats may be only too happy to let him follow through on his threat since it will now be easy for them to blame the president for any government interruption, which would probably aggravate many Americans,” the New York Times reports. “President Trump is strategically separating himself from Republicans in Congress, an extraordinary move to deflect blame if the GOP agenda continues to flounder,” the Washington Post reports. Thanks for the link! I’ve been saying for years that most parents aren’t capable of making informed educational decisions. A Proposal from CATO to manage the cost of any President’s Secret Service budget.